Disabilities take various forms. The disability may be a slight or severe physical disability or it may be a slight or severe intellectual disability. Sometimes it is a combination of both. Everyone is different. 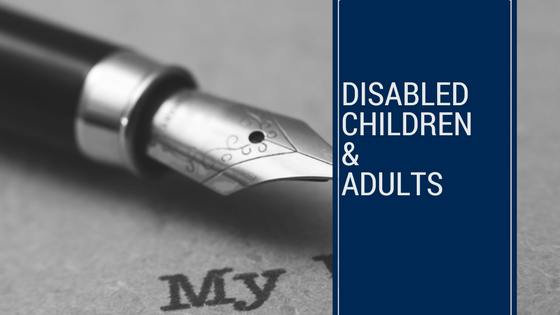 Parents who care for disabled children quite often take on a very heavy burden. The burden of course is alleviated by the parent’s love for their child, but nonetheless, what a parent does for a disabled child is often a highly time consuming, exhausting and long-term act of service. At Mitchells we are able to assist our clients think through these transitional questions. Perhaps the worst thing that any parent can do is to ignore the above transitional questions. It is always much better to plan for things rather than making decisions hastily in emergency conditions.